A few days ago I returned from Curaçao. I spent three weeks there. Maybe you think: “Curaçao, Caribbean, beaches, palm trees, dolphins, blue drinks”? Yes, that's Curaçao too. And I did visit a beach and swim in the Caribbean Sea. But I did a lot more. During those three weeks I stayed at the 'kunuku' (plantation) of Aishel. 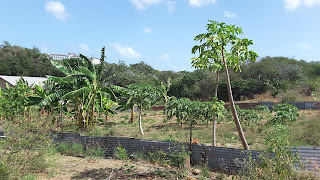 She has bananas and papayas and other fruit trees, a field full of large pumpkins, nice herbs and a small nursery (mostly moringa trees). Her land is large, half of it is all 'mondi' (nature, wood). Some twenty meters from her own house there's a wooden cabin. That was my 'vacation home'. But not yet the first night. It had to be tidied up and cleaned first. So the first night I slept in a hammock between the trees. I prefered that over sleeping on the couch in the living room, even though there was some rain. Next day we made the cabin ready for my stay. Aishel is a busy woman, she has a lot to do, not only on her plantation. So she needed help. I got some tasks to do at the plantation: watering the plantation (opening a tap in a drip system, waiting for 5 minutes, then closing this one and opening the next one, etc.) each morning; watering the nursery twice a day (with a hose) and cutting the tree-killing rubber vines (Cryptostegia grandiflora). And I did some household jobs. At the beautiful Caribbean island of Curaçao urgent help needed for an organic plantation. Do you wake up early every morning? Do you love a tropical climate? Are you in good condition? Are you more of a worker than a talker? Can you recognise the bad plants from the good ones? Are you persisting? Do you like camping in a non-luxurious accomodation (your own tent, a hammock or a wooden cabin)? Are you not afraid of tiny bugs (that might sting or bite)? Yes, are you that person? Then this will be the perfect vacation or 'sabattical' for you! You only pay for your own transportation and for the food that doesn't grow in the plantation. I recommend it, I enjoyed it very much and will return there as soon as I can! While I was there an outdoor bathroom was built, of pallet wood. When that's finished an outdoor kitchen will be made next to it. 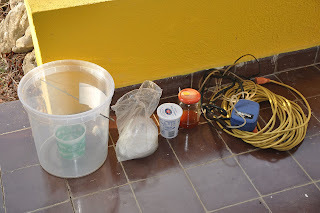 So the life of the camping guests will become a little better … you won't have to use the bathroom and the kitchen in Aishel's own house, like I did. Translated in English 2016 Dec. 30. Moringa (Moringa oleifera) is native to the Indian subcontinent. Now it grows in tropical and subtropical areas all over planet Earth. Leaves are loaded with vitamins, minerals and all of the essential amino acids. Eat them in a salad, or dry them and use as herbal tea. Every part of the tree, from the bark to the leaves to the roots, is used in traditional medicine. Fodder for cattle, increasing their milk production. 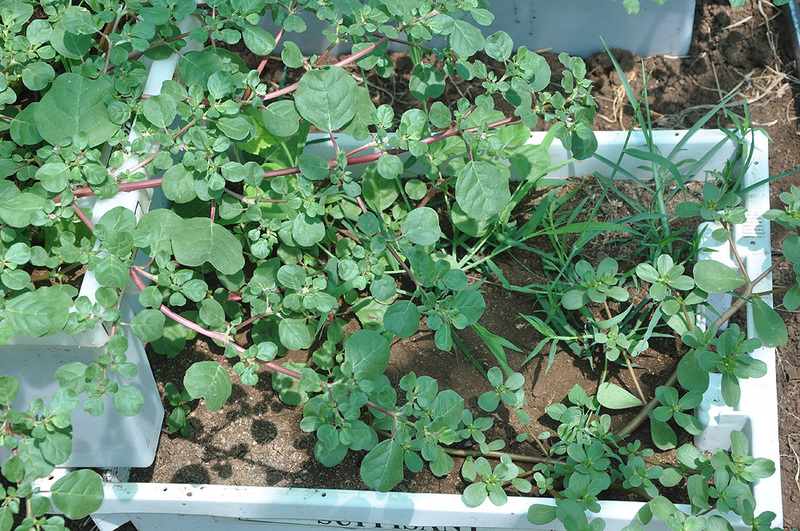 A plant-growth spray made from Moringa oleifera leaves increases crop production. It was a long time ago, not meaning there was no news … on the contrary: there was so much to do, there was no time left for writing! First that is the case with Roland and v-Ital. Roland lives on the island of Curaçao for a year now. During that year he planted a food-forest, and he started his organisation. The difference between living in the Netherlands (before) and in Curaçao (now) is striking. Although this Caribbean island is part of the Dutch kingdom, its rules and laws are very different. Or you could say: most of the rules do not exist at Curaçao. There's so much freedom to do what you want … I (Inge) can't imagine it fully (I only was there a few times for a month). First Roland had an underpaid job there, but suddenly there was the opportunity to start an organic farm, together with some others. 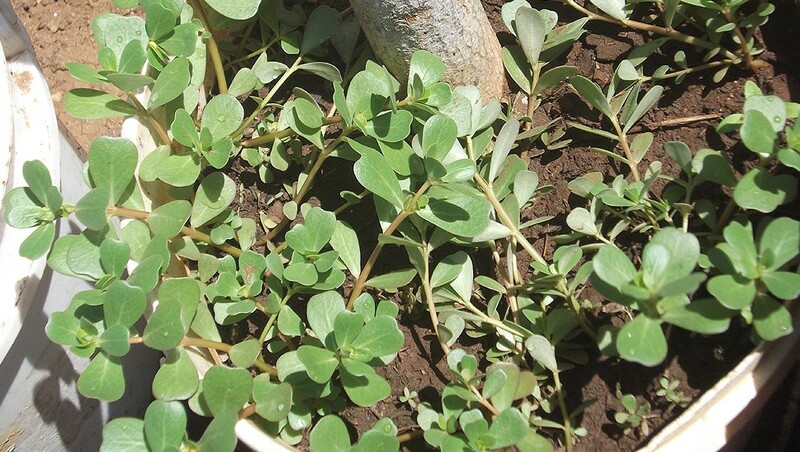 The soft, succulent leaves of Bembe have more omega-3 fatty acids than in some fish oils. If you are a vegan and pledge to avoid all animal products, here is the answer! Go for this healthy dark-green leafy vegetable and you can forget about fish! Botanically, this herbaceous leafy vegetable belongs to the family of Portulacaceae and scientifically known as Portulaca oleracea. 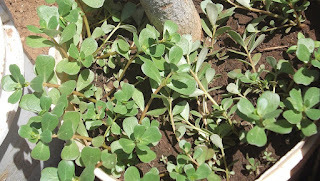 Its English name is Purslane. There are varieties which differ in leaf size, thickness, leaf arrangement and pigment distribution. 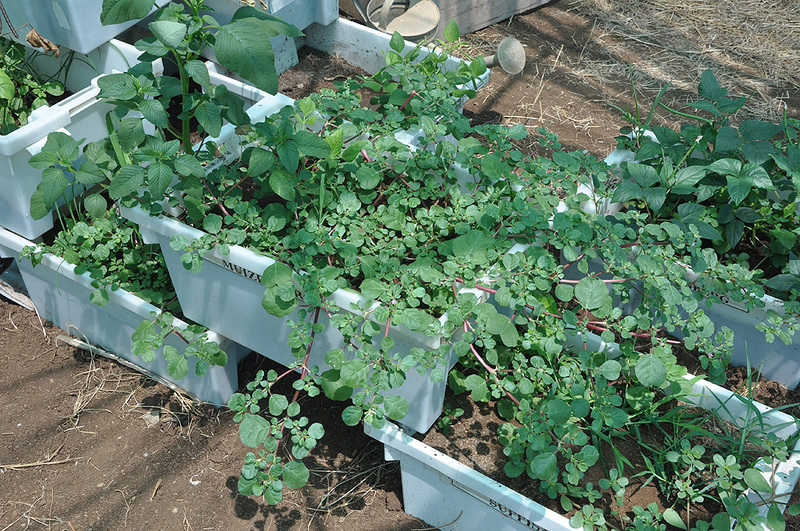 This hardy plant requires relatively little water and soil nutrients. 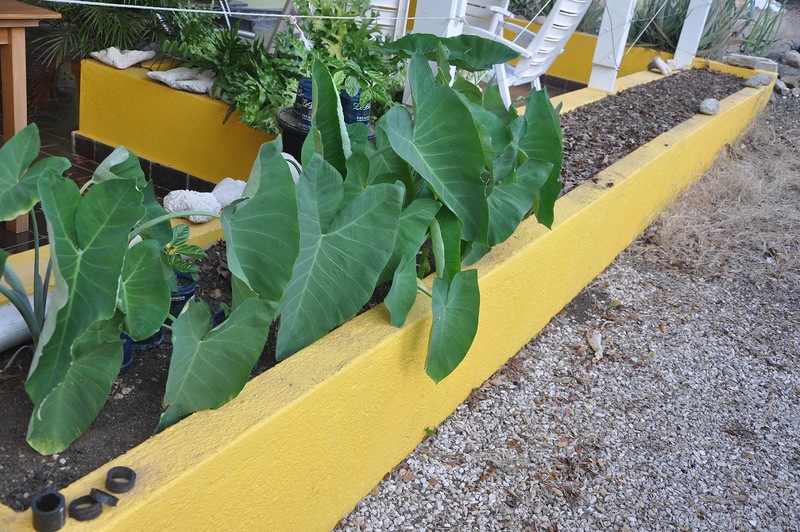 It grows well in sunny climates. 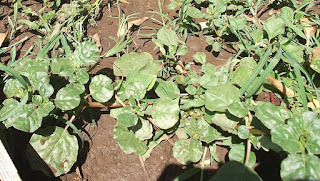 The plant grows up to 12-15 cm in height as a low-lying spread. Nowadays no one is interested in consuming this plant and it grows everywhere and does well in this dry environment. This wonderful green leafy vegetable is very low in calories (just 16 kcal/100g) and fats; nonetheless it is rich in dietary fiber, vitamins, and minerals. Fresh leaves contain surprisingly more omega-3 fatty acids (a-linolenic acid) than any other leafy vegetable plant. 100 grams of fresh leaves provide about 350 mg of alpha-linolenic acid. Research studies show that consumption of foods rich in omega-3 fatty acids may reduce the risk of coronary heart disease, stroke, and help prevent the development of ADHD, autism, and other developmental differences in children. It is an excellent source of Vitamin A, (1320 IU/100 g, provides 44% of RDA) one of the highest among green leafy vegetables. Vitamin A is a known powerful natural antioxidant and an essential vitamin for vision. It is also required to maintain healthy muscles and skin. Consumption of natural vegetables and fruits rich in vitamin A is known to help to protect from lung and oral cavity cancers. Bembe is also a rich source of vitamin C, and some B-complex vitamins like riboflavin, niacin, pyridoxine and carotenoids, as well as dietary minerals, such as iron, magnesium, calcium, potassium, and manganese. 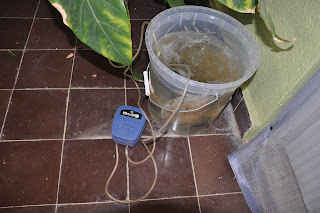 Wash fresh leaves and stem in clean cold running water in order to remove any sand and residues. After removing from water, mop it with soft cloth to remove any moisture in them before storing in the refrigerator. Bembe can be kept in the refrigerator for about 3-4 days, but should be eaten while the leaves are fresh and not wilted. The stems and flower buds are also edible. Trim the tough stems near roots using a sharp knife. Cook under low temperature for a shorter period in order to preserve the majority of nutrients. Although antioxidant properties are significantly decreased by frying and boiling, its minerals, carotenes and flavonoids may remain intact with steam cooking. Bembe contains oxalic acid, a naturally-occurring substance found in some vegetables, which may crystallize as oxalate stones in the urinary tract in some people. 100 g fresh leaves contain 1.31 g of oxalic acid, more than in spinach (0.97 g/100 g) and cassava (1.26 g/100 g). It is therefore people with known oxalate urinary tract stones are advised to avoid eating such vegetables belonging to Amaranthaceae and Brassica family. Adequate intake of water is advised to maintain normal urine output. Roland thanks you all. He received the 700 euros he asked for! He's still busy packing and sending the moringa tea to all addresses. After buying all needed materials there was some money left. He used it to buy some coconut and eucalyptus trees and vegetable seeds. Roland is inspired for the proces of building up a cooperation with other small enterprises in a way fit for the future. A small amount of money can lead to big changes! 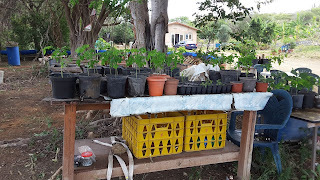 His vision is more than an enterprise, it's a new society around healthy agriculture in Curaçao and Suriname. 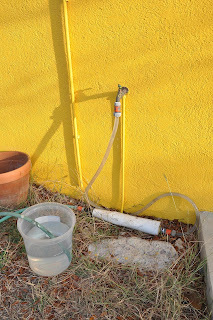 There was a old pump in the garden, to get the water from 60 meters deep. They used the water for the garden and the washing machine. But it was broken, could not be repaired again. The tap water of Curaçao is not good for plants, and very expensive. or you donate the money as a gift. This is to show how this 'new society' can work. Better than to put your money on a bank account, is to invest it in a positive future. Do you want to be one of those 12 people? Donate here: IBAN NL42 INGB 0006 7995 46 of A.C. van Reenen in Curaçao. Add the option of your choice. 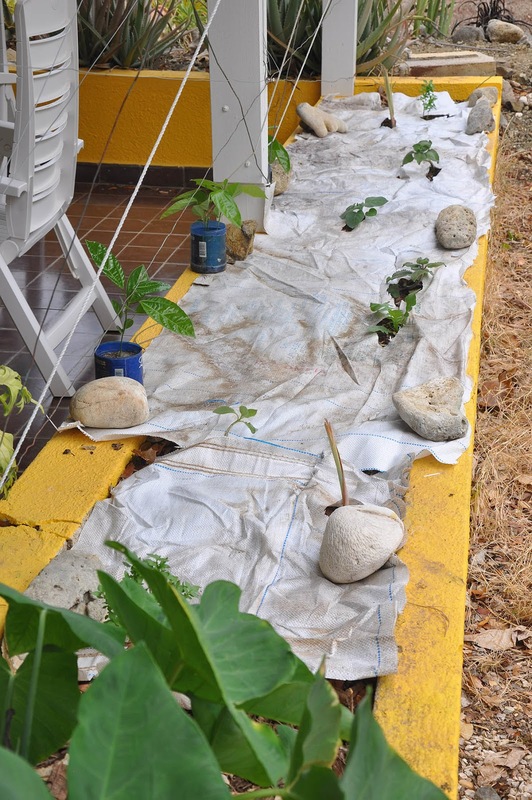 So you understand: only mulching is not sufficient at Curaçao. Best would be to use wood chips, a layer of 12 cm (5”). Because I don't have wood chips, I had to find a way using materials I do have. 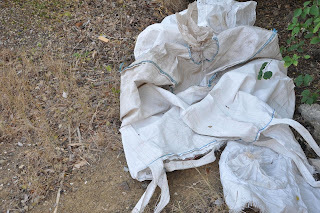 I have a large poly bag, it can last at least a year in the sun. I cut it and laid the parts on the soil. In this way the soil can stay moist a little longer. 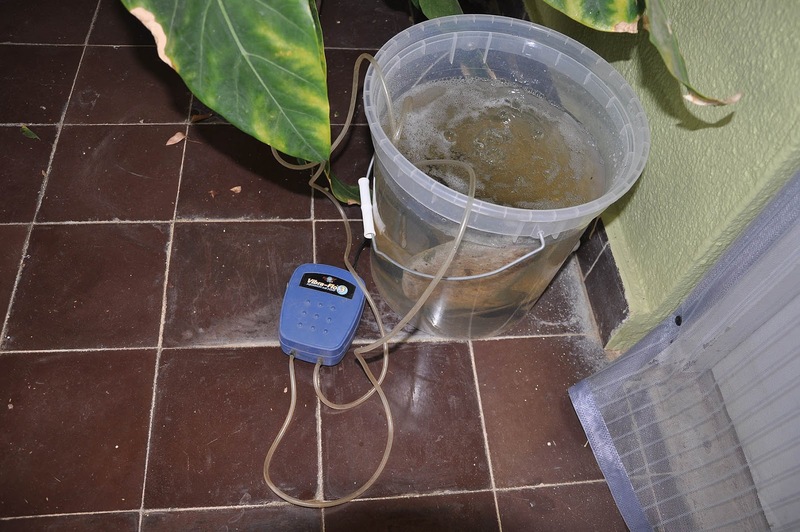 For two hours I pump air through the water, using a fish-tank-pump. The water is passing an 'emploder', existing of two vortex shapes and two magnets. This makes the water more lively. 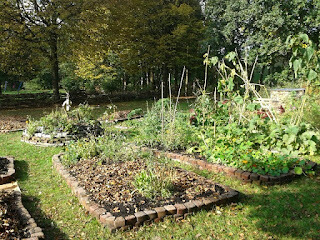 Then I add bokashi compost and epson salt to the water. This makes the water comparable to rainwater. This water mixture I use to wet the soil several times before planting. Then I planted Tayer leaves (Tahitian Spinach, Xanthosoma brasilense). Next time: more plants and more on the emploder.